This article may contain affiliate links, which means that at no additional cost to you, I will earn a small commission if you click through and make a purchase. All opinions expressed here are my own. My husband and I have been talking for the last couple of years about retiring to Maine (at some long distant date). Which is funny because until recently, I had never been there. But what I had heard about it, the cold, the beautiful coastlines, the plentiful hiking, the friendly people (did I mention the cold? Because that’s the first thing out of almost everyone’s mouth when you mention “Maine”) was enough to convince this Florida girl that we ought to at least take a closer look (yes, I’m good with cold weather). 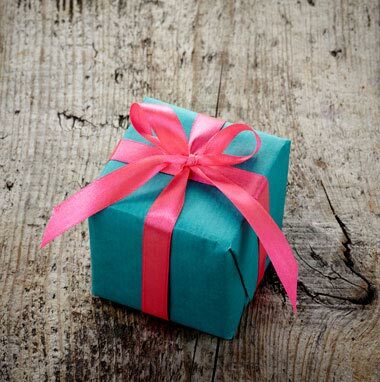 So, last Christmas one of the gifts my husband gave me was dinner in Maine – as he explained, we should settle on a long weekend to get up there and actually do some exploring. Between work and travel, family drama, and really just life, it took until mid-November to make it happen. We weren’t sure if the fall leaves would still be up or if it would be too cold, but we decided to go for it. We figured we would fly in to Portland and out of Bangor and make it a road-trip weekend to see as much as possible. With all the fall craziness, we did not have much spare time to plan anything other than our flights until a couple of weeks out. I googled “drive from Portland to Bangor” and after about ten minutes of research understood that we would have no shortage of options for scenic and interesting stops. We arrived in Portland just before lunch and since the sunset was expected by about 4:30 p.m., we decided to head south for some exploring before we checked in. Because it seemed mandatory to see some lighthouses while we were in Maine, we decided to tackle Cape Elizabeth to see the Cape Elizabeth Light, also known as Two Lights, followed by the Head Light and Fort Williams Park. The station at Cape Elizabeth was established in 1828 with the present lighthouse built in 1874. Unfortunately for visitors, the keeper’s house is privately owned so the lighthouse and grounds are not open to the public. (sidenote – can we please talk about how fun would it would be to own your own lighthouse?) But both make for a lovely photo from the beach just next door. The Head Light is Maine’s largest lighthouse, and even more picturesque. 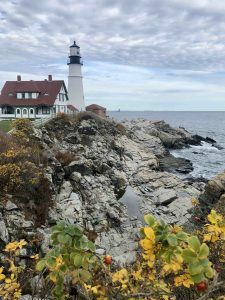 One of the downsides of travel to Maine in November is that attractions and businesses start to close for the season – so we didn’t get to visit the museum or the seasonal shop. But we did enjoy the crisp fall air (and by crisp fall air, I mean the slightly bone-chilling wind off the ocean that cut through our not-winterized airplane attire). 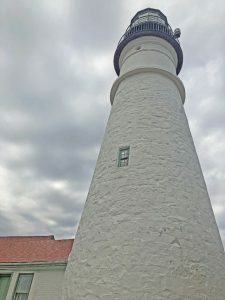 And we had fun checking out the lighthouse and the surrounding grounds of Fort Williams Park (checking out the park grounds on this day meant getting out of our car just long enough to take a couple of great photos and speed walk back to our heated seats). Driving into Portland, we had a couple of hours before dark set in, so we did some more exploring downtown as our stomachs rumbled. We stumbled into the Grill Room and Bar for lunch and it was the perfect cozy refuge from a cold day. Craig decided on the steak pizza (pizza is a food group for him) and I went with an a la carte build your own chicken sandwich. 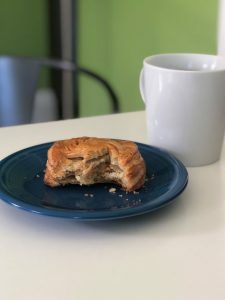 It turned out to be the best sandwich I’ve had in a while – perfectly done, moist chicken with brie oozing through it on a soft, doughy roll – and Craig devoured his entire pizza. Safe to say we both recommend! In Portland we stayed at The Press Hotel. We had read some great online reviews and it definitely lived up to the hype. For my more in-depth review, click here. Our only regret about the hotel was that we couldn’t stay longer. We will definitely be back. We began the day with pastries to go from the Standard Baking Co. I can’t do their croissants any kind of justice in words, but they were fantastic. The perfect flaky crust on the outside wrapped around a soft, just-doughy-enough interior. We really regretted not picking up a few extra treats for the road. We drove through a number of neighborhoods as we left Portland, checking out “For Sale” signs, ocean views on different streets, and just generally getting a feel for life there. Although late fall and many leaves had fallen, many trees were still on fire with bold hues of red, orange and yellow. 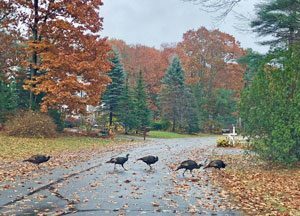 For some reason, there were a ton of wild turkeys out and about, and I squealed every time we saw one (yes, really – it doesn’t take much sometimes). Camden is exactly what I had imagined when I thought of quaint Maine coastal living. Its streets look like they jumped out of a story book, the people are warm and inviting, and it maintains that small, but not too small, town feel. The harbor is loaded (but not too loaded) with sailboats. Its shops have some of the typical Maine tourist fare, but somehow the town itself doesn’t feel touristy. 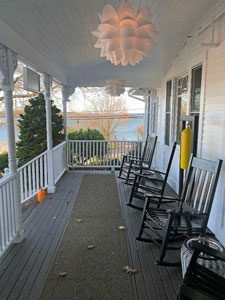 We spent our second night at the Camden Harbor Inn. A Relais and Chateaux property, it was such a treat. We already can’t wait to return. For dinner we headed to Rockland (apparently known as Camden’s hipster neighbor), where we had made a reservation at Suzuki’s Sushi Bar. Unfortunately, by the time of our reservation (7:45 p.m.) they had run out of tuna, which limited our options (I’m not a particularly adventurous sushi eater, so tuna is generally my sushi “foundation”). We tried a couple of rolls and decided to retreat back to the hotel and visit the Inn’s restaurant, Natalie’s, for a second course. After dinner, we took advantage of the wood-burning fireplace in our room and drifted off to sleep in its crackling warmth. After our breakfast back at Natalie’s, we made the quick drive to Belfast. Belfast feels sort of like Camden’s older, more eccentric stepsister. There is one main street of shops leading down to the harbor. And lots of cool architecture around town, both residential and commercial. We found it utterly charming. Chatting with folks around town we learned that Belfast is at its core a city of reinvention. A town since the early 1770’s, it has seen several industries come, build up the town and leave. Wooden shipbuilders left around 1900 and the local industry shifted to harvesting seafood. After World War II, the Belfast economy revolved around the poultry industry, but when that industry collapsed in the 1970’s, the silos that once fed millions of chickens were demolished. In the early 1990’s, the bank MBNA set up two facilities in Belfast, bringing in more jobs and investment in the community. But when MBNA was bought by Bank of America, it disappeared, along with the jobs. In the 1990’s two shipbuilders moved back in and have restored Belfast’s working waterfront and helped revive the local economy once again. 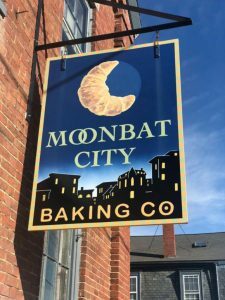 Our first stop in Belfast was the Moonbat City Baking Co. I can’t even tell you how much we loved this little bakery. (and yes, if you can’t tell, this was a fairly high-carb road trip weekend!) First of all, the pastries were amazing. Everything at the eatery is made from scratch on site and with a lot of TLC. Snacks at the Moonbat City Baking Co.
We learned the bakery’s croissants take two and a half days to complete. They were flaky perfection, and the pumpkin muffin I got was pure divinity. Which explains why in the summertime there is already a line outside when they open every morning at 7:00 a.m.
No sooner than we opened the door into the cheery, lime-green-walled bakery, were we greeted by the owner and chef, Michelle Berry. We probably overstayed our welcome because we enjoyed chatting with her so much. She has been a chef for 35 years, in restaurants from Florida to Boston, before deciding to open a bakery in Maine at age 59. Given her interesting story, demonstrable passion for pastry, sampling Michelle’s goodies is an absolute MUST if you find yourself in Belfast. Because Craig is a real sport, he wandered up and down Main Street with me to check out the shopping. From the “Old Professors Bookshop” to “Eat More Cheese” to “Heavenly Yarns” and the irreverent “The Meadow,” we found the town had a really quirky, fun vibe. We even stumbled upon a store called “Heavenly Bean Bags” that, yes, sells nothing but bean bags made in Maine. I’m sure our kids were disappointed we did not bring any home. Our only disappointment was a store there that sold nothing but Christmas goods. I buy a Christmas ornament every time I take a trip, but this Christmas store had not a single Maine-themed ornament! We ended up enjoying Belfast so much that by the time we made our way to Bar Harbor and Acadia that afternoon, our time was cut short and we had to cram in some quick sightseeing before the clock hit sunset at 4:30. So instead of hiking like we had hoped in Acadia, we drove the Park Loop Road and took in a few of the stunning views. Unfortunately the road to the top of Cadillac Mountain was closed, but we agreed that just meant we had to plan a trip back when we would be able to hike. This may sound bad, but Bar Harbor felt a bit like the Myrtle Beach or Daytona Beach of Maine – substituting fleece jackets, boat shoes, and salt water taffy as the state’s version of jean shorts, motorcycles and tattoos. It is a true summer season town, open from June to November, and we arrived just on the cusp of everything shutting down. Bar Harbor was where we bought most of our souvenirs. Because we arrived at the end of the season, we got great deals on t-shirts for the kids and a mug for me. Sidenote – I collect a mug (or two) from all of my travels, which has resulted in an entire cabinet of mugs in our kitchen. A cabinet at which Craig sighs loudly every time he opens and can’t get to one of his favorite mugs without removing three of mine to reach it. I wish I could think of a way to cull my collection, but each mug truly has meaning and memories! And yes, I bought not one, but two, mugs on this trip. If you’re thinking to yourself that what you’ve learned so far is that I collect both Christmas ornaments and mugs when I travel and that is kind of excessive – well, you’re probably right. But let’s get back to Maine. We stayed at the Bar Harbor Inn. Eating at the resort’s Reading Room restaurant for dinner, we learned that we had arrived for the restaurant’s last open night for the season, and the hotel would be closing just after Thanksgiving. The restaurant was quaint and the resort reminded us of a less formal Homestead Resort in Virginia. But the staff at the hotel and around town all seemed tired. As if they were all limping towards the off-season when they would relish the break but then have to figure out how to fill their time for a few months. 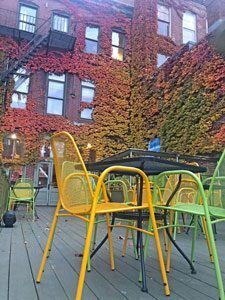 While we did not immediately fall for Bar Harbor the way we did for Belfast, Camden and Portland, we agreed that we had not had enough time to fully judge the town. We plan to go back when the weather is nicer and more is open. We spent our last half day in Maine driving to Bangor to fly home. It was Veteran’s Day and there was a parade going through downtown Bangor, so no wandering around for us – and unfortunately we didn’t enough time before our flight to stop and enjoy the parade. Better planning next time! Phew – we packed a lot into just a few days. As we progressed through the mid-coast, looking at houses along the way and daydreaming about life in a small town up here, it seemed the perfect trip for my current state. 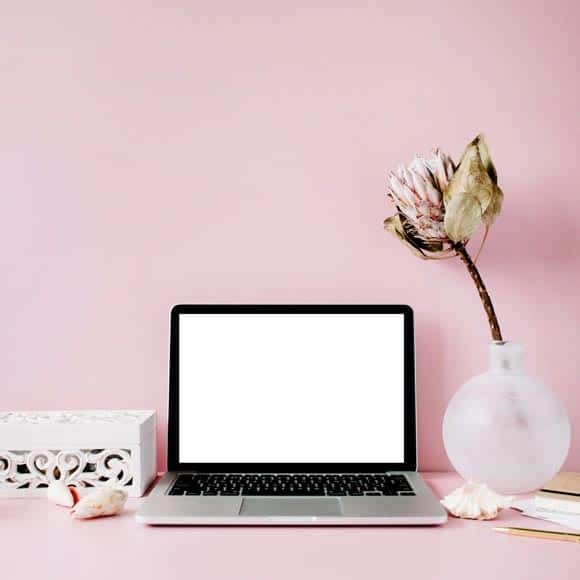 Here I am embarking on a new journey with this blog and it is scary, exciting, and there are days when I ask myself what in the world I have gotten myself into. But at the end of the day – it is the changing of a season, and the start of an exciting new chapter. Speaking of chapters, I’ve already started reading a book that my sweet friend Diane recommended, Moving to Maine, and am daydreaming of sipping coffee by a firepit overlooking the water in our fantasy retirement home. I don’t know if we will end up retiring to Maine, but it sure has been fun to dream about it. If money was no object and you could retire or have a second house anywhere you wanted, where would you go? Comment below! Fill Your Easter Baskets Without Leaving Your House! Sounds like a great trip! I’m definitely adding Maine to my list of places to go now. My husband grew up in Maine so we have spent lots of time there over the years. You MUST go back to Bar Harbor when you can get up Cadillac Mountain! The views are just wonderful! Also, Schoodic Point is close to Bar Harbor and, at least as of a few years ago, was quite a bit less touristy and still very, very pretty. If you really like hiking, head to the interior of Maine and check out Baxter State Park (where Mt. Katahdin is located). We never made it quite to the top of Katahdin but are still hoping to one day. There is wonderful hiking, though, and it is all beautiful! Moosehead Lake is also beautiful, although I still complain that I never saw a moose (hubby swears they are there, but I’ve never seen one!). Thanks so much, Dawn! We are excited to return and get to Cadillac Mountain. And will definitely check out Schoodic Point and Baxter Star Park. Thanks!! Looks like a great time! Maine has always been a goal. I have never been to Maine, but it has been on my to do list for years..thank you for all the area tips, this makes me want to go more!! It had been on my list forever also; I’m so glad we were able to do it and we can’t wait to go back! This just inspired a new trip for me and my hubby! So glad to hear!! It’s so gorgeous there, y’all will love it! We have been wanting to plan a trip to Maine! Saving this for future reference when we actually get up there, hopefully soon! What a great trip! Beautiful photos! Such a beautiful trip! Maine has been on my bucket list for a long time, I’ll definitely use this guide as an inspiration. Thanks! You will love it! Great photos and so beautiful! Looks like a great trip! Maine is on my list of places to visit. We actually honeymooned in Bar Harbor!! It was a crazy trip, but we loved it. Gorgeous, quiet…..it was perfect for us. In fact, we really want to go back to see it again. Great piece. Maine is truly a beautiful place to visit. Oh, we totally LOVE Maine, have visited many times. Acadia is one of my favorite places on earth, great post thank you for sharing!